The majority of the mine workings we saw were in Gunnerside Gill, which extends north from Swaledale shown on the map below. On the ground we found rock strewn gullies and heaps of gravel, still devoid of vegetation. 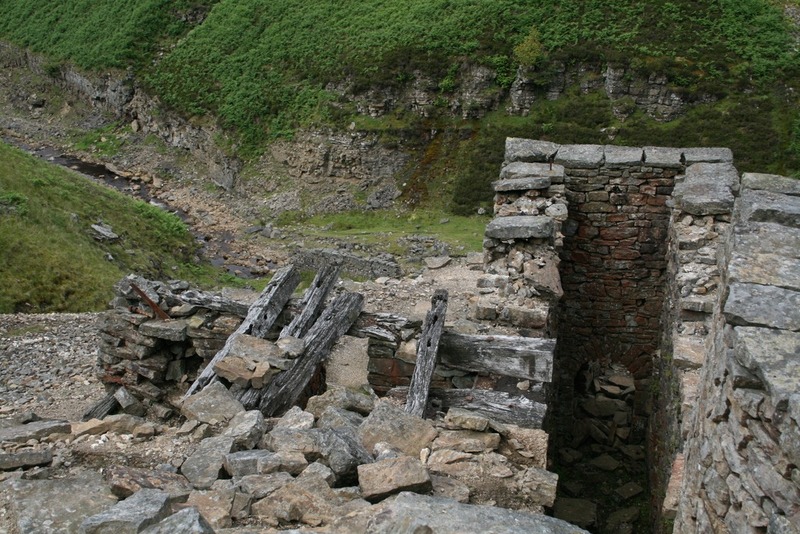 There were also ruined mine buildings, the occasional opening into the hillside and the odd bit of rusting ironwork. The most distinctive elements of the remains are the “bouse teams”, these are sets of bunkers – just the dividing walls remain – which were used to store the ore (or bouse). Quite a few of the stone surfaces are covered in a reddish deposit; elsewhere this has been identified as a lichen, but I believe it’s lead oxide. The workings are named by the “level” or horizontal tunnel which they served, the photos here are taken around the Bunting (or Bunton) level. Further down the Gill, closer to Gunnerside, are the Sir Francis Level workings; although these are less extensive at ground level, they turn out to have quite fantastic remains underground. Intrepid cavers have been down and taken some impressive photos, and you can read more about the Sir Francis Level workings in this report , here and here too. 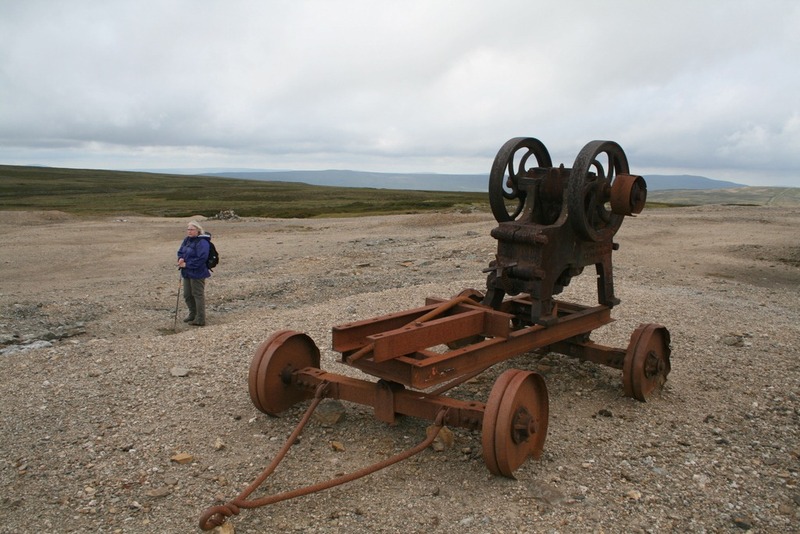 These were the most recent workings in Gunnerside Gill and were in operation from 1864 until 1891. 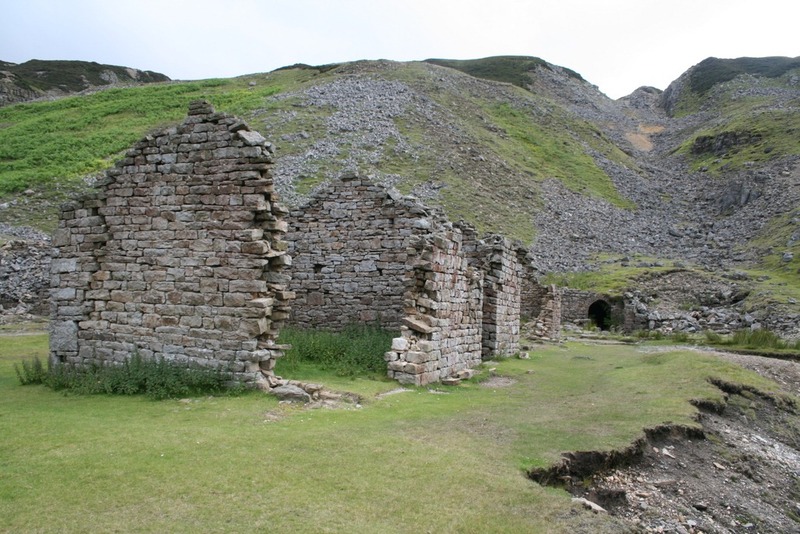 Lead mining has been carried out in the Yorkshire Dales since Roman times, the workings at Gunnerside Gill started in the 16th century but the majority of the visible surface remains are from the 19th century. The Bunting (or Bunton) level where the photos were taken was opened in 1802 and closed in 1898. The Yorkshire Dales are substantially formed from limestone and gritstone outcrops laid down in the Carboniferous Period some 320 million years ago1. The lead ore occurs in veins which were deposited hydrothermally: hot pressurised liquids containing a range of minerals were forced through cracks in the native rock and deposited what they carried when the pressure and/or temperature dropped. The minerals are not conveniently deposited by type but mixed together. The veins are quite narrow – typically only a metre wide – but stretch deep underground. This is reflected in the manner in which they are mined: initially vertical shafts were mined down to follow the veins. Later horizontal “levels” were mined to meet up with these vertical shafts which made the extraction of both ore and water easier – water will drain out of a level but puddle in the bottom of a shaft. In addition to this type of mining “hushing” was also used: this involves sluicing large quantities of water down the line of the vein to erode out the rock. 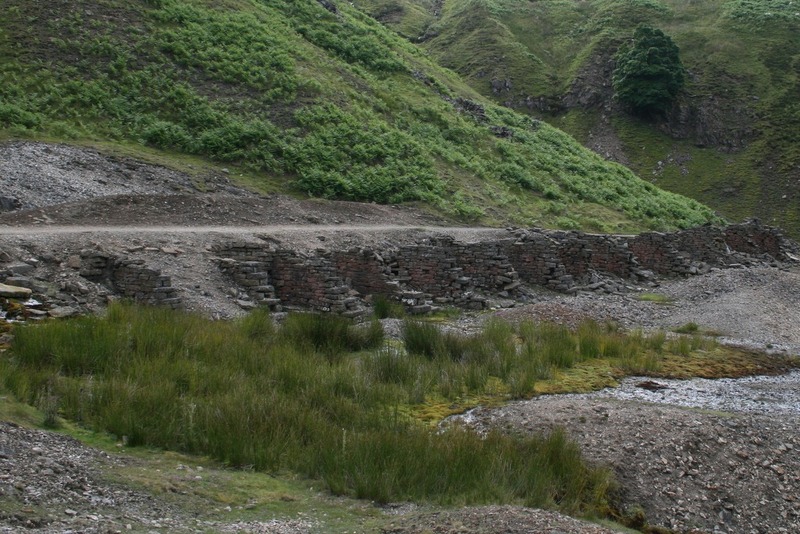 This process was used in the Gunnerside Gill area from the 1780s to 1820s, and is what has left a large part of the surface remains. These are marked on the map as “hushes”. The extent of the workings can be seen quite clearly in Google Earth images (here). The particular mineral in which the lead occurred is galena (lead sulphide), it is relatively dense and this property was used to separate out the galena from other minerals using a process akin to panning for gold. The ore containing rock is broken up into pieces and as far as possible the galena rich chunks are picked out and chipped off using hammers – this is known as dressing. This ore is then further broken up into smaller pieces. Earlier, this would have been done manually but later it was done using a water-powered mills, and still later it was done by steam-powered machines. These smaller pieces of ore are then buddled in troughs or hotching tubs – basically this simply means add water then shake, this separates out the material by density. Once reasonably well-separated ore is obtained it is converted to metal in two chemical steps. First the ore is roasted to drive off the sulphur and convert it to lead oxide, then the oxide is smelted with carbon which removes the oxygen from the lead to produce the metal. 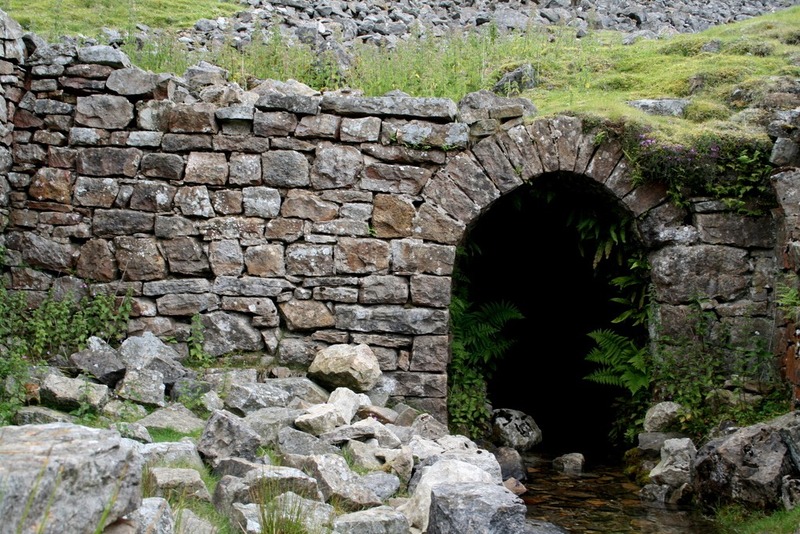 There were smelting mills in Gunnerside Gill but ore was also transported underground to the next valley and smelted in the Old Gang Smelting Mills. We didn’t visit these but they had flues extending up the hillside a distance of hundreds of metres. The reason for this was two-fold: firstly, the gases driven off the ore during smelting were pretty noxious and secondly, the long flue allows soot to condense back out as it cools and this soot can be contain high concentrations of minerals. 1. See p13-22 of this report by the North Yorkshire Geodiversity Partnership for more geology.